At about 07:40 p.m., from the St. Joseph railway station, a shiny object was seen, "much bigger than a shooting star and moving from the hospital to the Vosges, followed by a blue-red streak." On November 4, 1954 at 07:40 p.m., a luminous ball followed by a red and blue trail flies over the civilian hospital of Colmar in direction of the Vosges. The St. Joseph railway station is now a halt fot the tram-train going to the Munster valley in the Vosges, rue du Val Saint-Grégoire in Colmar. The UFO said to have gone to the Vosges, so between the Southwest, West, Northwest. 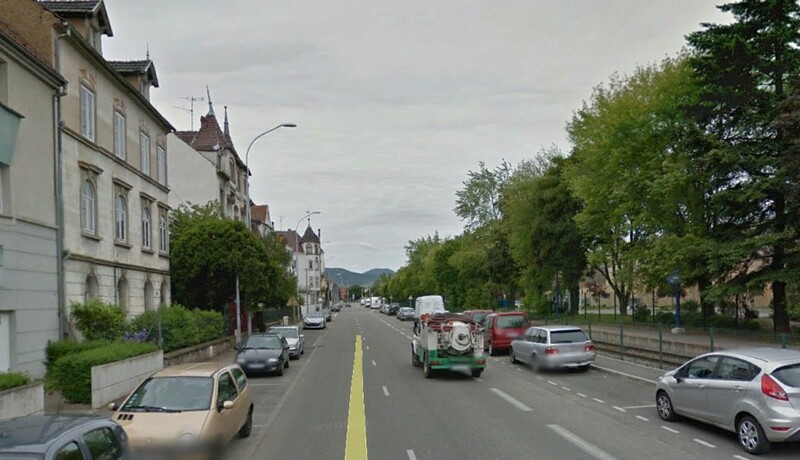 And even more probably at 298°, if the witnesses were standing in the street and watched the Vosges as visible from the street (Photo below by day in 2013). So it went in a visual direction between Kaysersberg and Lapoutroie. The hospital of Colmar, where the thing is reported to have come from, is practically in the same visual direction from the place of observation, just a few degrees farther north. Presumably this meteor crossed a small visual angle and was very far away, surely visible from the other side of the Vosges too. There is little information to help here about what was seen. There was the mention that it was brilliant, thtat it had a trail, that it was "much bigger than a shooting star". This all suggest that apart from the size it looked like a shooting star. On thing that looks like a shooting star but much bigger is a meteor. 3.0 Patrick Gross May 3, 2014 Additions [dh1], [cv2], Summary. Explanations changed, were "Not looked for yet. Airplane, meteor..." previously.